"Portable, Storable, and Adorable! Whether you're taking a walk in the park or rolling through the grocery store, this stroller-compatible peekaboo pup is ready for surprising pop-up fun almost anywhere. The included strap helps you keep playtime contained on almost any stroller to prevent the toy from dropping and falling - no need to keep picking the toy off the floor! 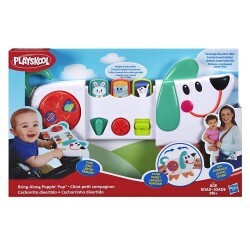 This unique toy can entertain kids on the go with fine-motor activities such as toggling the sliders, pressing the button, and spinning the clicking dial. As little hands explore, they can make the peekaboo animal friends pop up, which can help encourage an understanding of cause and effect and object permanence. For easy storage, the pup's design also collapses to a compact size and can fit into most diaper bags. It's as easy as play, stow, and go! 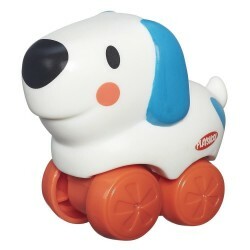 •Includes Bring-Along Poppin' Pup toy. • Ages 9 Months and Up"